Know Error can be easily integrated within an existing routine clinical process, regardless of whether pathology services are performed in house or by a reference lab partner. 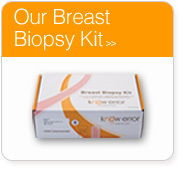 All biopsy kits included swabs for collecting patient DNA and formalin filled biopsy specimen vials. 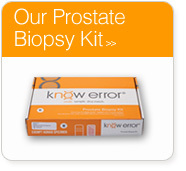 The know error® system involves three simple steps and requires minimal disruption to the standard biopsy collection process. Before the biopsy procedure, a reference sample of DNA is taken by swabbing the inside of the patient’s cheek. The swab is then sent to Strand Diagnostics. The patient’s biopsy tissue sample(s) are placed in bar-coded specimen containers included in the biopsy kit and sent to the pathology lab for evaluation. 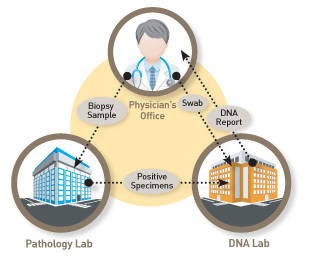 If the biopsy results come back positive for cancer (malignant) a small piece of the tissue is sent to Strand Diagnostics, where a DNA test compares the (1) swab reference sample to the (2) biopsy tissue sample(s) to assure a (3) DNA match and the sample purity. The DNA match confirms the diagnosis belongs to the ascribed patient and rules out the possibility of specimen contamination. Once the DNA test is complete, an electronic report (compatible with most EMR systems) is issued to summarize the findings. The turn-around-time (TAT) varies depending upon the specimen type, but reports are usually issued within 2 – 3 days after receipt of both the swab/reference and tissue sample(s). If a potential non-match is indicated, the appropriate parties are notified immediately to address the issue. Strand’s UroSeq™ prostate gene panel offers BRCA/hereditary gene testing directly from Know Error swabs.